Getting motivated can be the most difficult part. Have you ever found yourself saying “I am going to get up off this sofa and get started on cleaning, laundry, de-cluttering, as soon as I am done playing on facebook, reading blogs, playing this game, as soon as this show is over?“ The time we spend thinking about what needs to be done takes up a lot of energy and wastes time. So what do we need to do to get started? I love it when I have the day or even just a morning to get some work done in my home. Today I am home for the day. Heaven!!! Okay, I am going to get myself dressed so I can tackle some chores that have been neglected lately. Be right back!! Okay, I am back, dressed, made my bed and put away some clothing that had accumulated over the week, got the laundry sorted out and have the dishes soaking in water. Do you like to make lists? 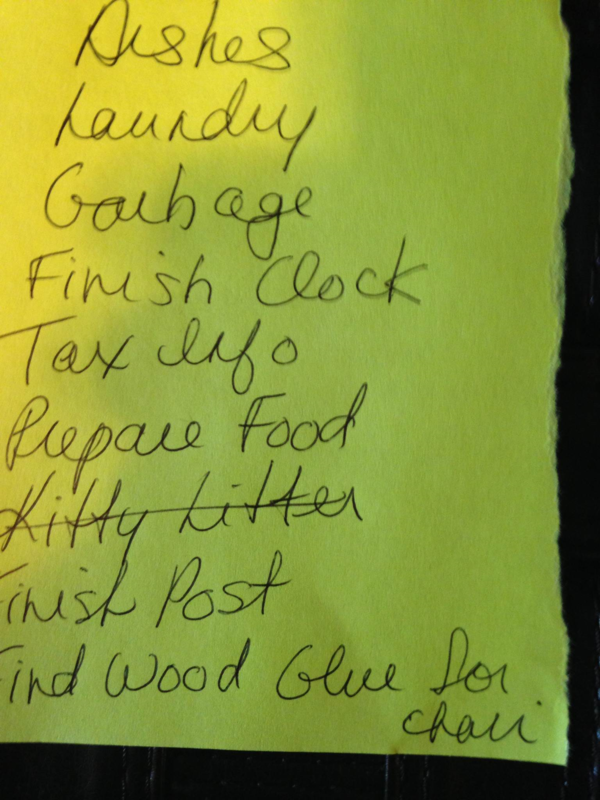 I am a list maker and love to cross those things off my list. This is my list so far. I don’t like it to be too overwhelming as I tend to do more than is actually on the list anyway. I am a multi-tasker and like to have a number of things going on at once. I love being productive and when I am cleaning and de-cluttering I am actually in my happy place. Okay, so I am working on the dishes and there are a lot of them. I have to admit they are from the last few days and I do not have a dishwasher. I am the dishwasher. I am doing them in stages between writing, texting and tackling some of these other things on my list. Hmmm?? What to cook for today? I have a plan for lunch, using up some leftovers and cleaning out the fridge too (yes, not on the list but it all works together). I am going to make some chili with some frozen cooked hamburger and quinoa I have in my freezer. It will be yummy!! I love when I can use my crockpot which I only use when I am planning to be home for a period of time as it doesn’t have a timer. This might be a good investment though as it would be awesome to come home to the smell of a ready made meal especially after a busy day. I have had a jar of roasted red peppers on my counter for awhile now (expiry date May 2015) and I just found a recipe for Roasted Red Pepper Pasta and added it to my favourites. Perhaps, I could make this later this weekend. I am getting a little distracted here but it is all part of the big picture. Dishes are done, just in time to create a whole new batch. I love cooking and creating with clean counters and no dishes in the sink. I love having leftovers too which can mean easy meals and more time to spend doing other things. 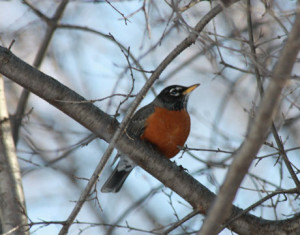 I am seeing myself getting outside, cleaning up my yard a bit and enjoying Mother Nature in bloom. Also, I have a plan to get on my bike and making this a routine as I am planning to go on a “Ride Don’t Hide” Bike ride this summer. (its a fundraiser for mental health) Excited!! I have made my chili and crossed a few things off my list but have a change in plans for today. My sister just invited me to go out for sushi so as much as I would love to stay home and work on my home, relationships are important to me too. So, the work can wait, there will be more opportunities later today or over the weekend to get things done. Back home now with a full belly so I am not feeling as motivated as I was. I feel happy with what I have done today, got some things crossed off my list, had a lovely visit with my sister and have the rest of the weekend to enjoy. Yes, I still need to gather some tax info (ugh!!) but will do it and I cannot find the wood glue for the life of me so may need to break down and purchase some. You know what will happen though, don’t you, yes, I will find it shortly after I purchase it. Schedule Time to Organize and Clean even if it is just 15 minutes at a time. Clear a staging area, Keep, Donate, Sell, Recycle, Throw Away. Just Get Started. This can be the hardest part but once you get going you might find that you are on a roll. Thinking about it can take more energy than just doing it. Do the more difficult task first and when you have the most energy. This way the rest of the tasks will be a breeze. Make a list. See mine above. It works for me but it doesn’t necessarily work for everyone. Do what works for you. Avoid Distractions. Turn off your cell phone, computer and television. Turn off notifications so that you do not have the temptation to check new messages especially if it is difficult to get back to the task at hand. Listen to some upbeat music. Working while a particular song is playing or keeping focus while a CD plays can be really helpful. I often listen to a CD when I do some sewing. When it is done, its time to get up and make a tea and have a stretch. Use a timer. Work at a particular area for 10 or 15 minutes and see what happens. You could also use a timer to allow yourself a certain amount of time to play on the computer or to relax and then when the time is up its time to get back at it. Seasonal Purge. Remember the season is changing so this is a great time to go through the winter boots, coats, scarves and mittens. Clean them up and get rid of anything that is worn out or missing its mate. Put them away all ready for next winter. I hope I have motivated you with this post. If so, please feel free to share this post. Do you have some great motivation tips that work for you? Please share! This entry was posted in decluttering, goal setting, Inspiration, organize, Organizing and tagged Clutter Challenges, De-cluttering from the Inside Out, goal setting. Bookmark the permalink. Great list of tips ! I was going to tell you my favourite but no, they are all great! I just multi tasked ironing….watched a Dvd on Yin Yoga. Enjoy the rest of your w/e! Did Tracey tell you I saw her and your Mom at Scotian Isle Wednesday? They both look great! So great T gets to spend Wednesday’s with your Mom. Great list and great job getting things done. It’s so true … just get started. Once you get up and get going, the motivation to keep going can build. Thanks. Thanks so much Regina 🙂 Yes, so true really in all areas of our lives. This really spoke to me! I’ve been wanting to go through a couple of areas in my home where I know there are things I can get rid of, and being a long weekend, this is the ideal time. Yet I spent most of yesterday on my computer. Scheduling time and listening to music are great suggestions. I will spend some time this morning finishing up important things, but this afternoon, I will tackle my office closet. Thanks, Kimberley! So glad I inspired you Janet 🙂 I usually find upbeat music helps me to get into the headspace I need to get some things done. I hope the work on your closet goes well. Thanks so much for commenting. It went great! I have a box of old files I can take for shredding, threw out a bag of old picture frames no one would want, assembled a bag of paper shopping bags that can be recycled, transferred some books from a box to my bookcase, and posted a bunch of items on a Give & Receive for Free Facebook group, of which four should be picked up today. Wow Janet, you sure did get motivated 🙂 I bet it feels great to get those things done and off the list. I am a huge fan of lists! 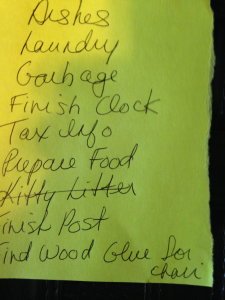 We had Good Friday off yesterday too and my husband and I each had our to-do lists planned as we’re hosting Easter dinner tomorrow and we got all our tasks done! Next weekend I’ll be working on my seasonal purge as our New England weather is slowly starting to warm up. Thanks for the tips Kimberley! Thanks for visiting Seanna – I am planning to read all of the Spring Cleaning posts so that I can get more motivated 🙂 Many dreary days right now heading into two beautiful days on Saturday and Sunday – this will help for sure. It really helps me when I use a timer & listen to music! And what a delight it is take a break to spend time with a dear sister or friend. 🙂 I have been writing my “to do” items on individual index cards and I enjoy tearing up the card when completed! I loved going along the ride for your day. That was really fun ! Two especially wonderful things about your day rose to the top for me. One was that you switched gears and went out with your sister, because you know that relationships are important to you. Priority setting at its best! What’s important to you and does enough of that show up in your days.Great. Thank you Sue. I remember that day like it was yesterday. I even remember the amazing sushi I had with my sister. I love days like this and wish I had more. I am thinking you meant #4 the Clock, which was more creative then taking out the garbage lol. Thank you for your comment.